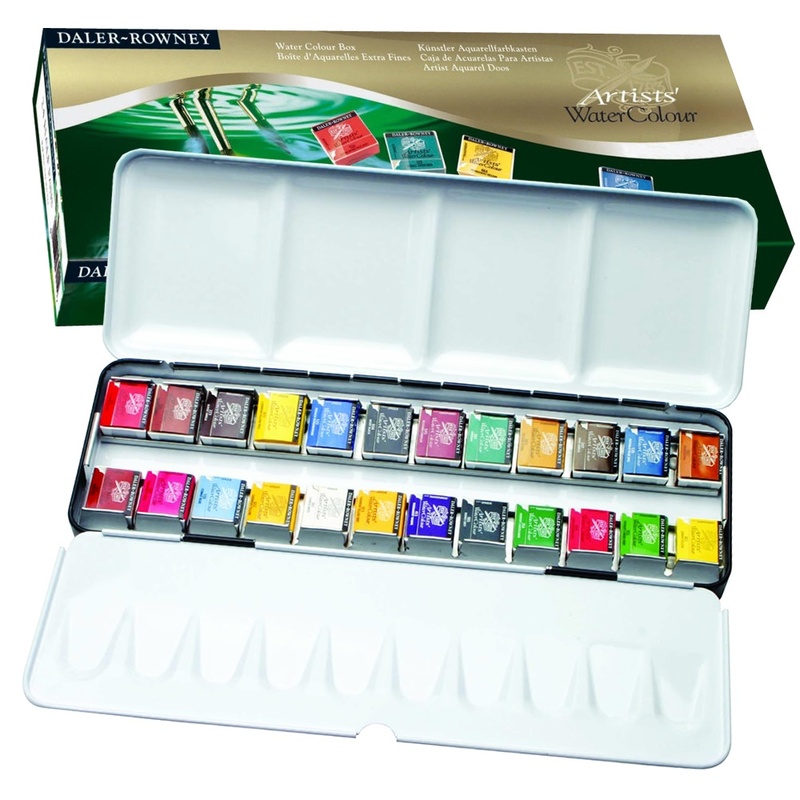 This premium Artists watercolour set made by Daler Rowney includes 24 Artists Half pan colours. These are the post popular colours chosen by Artists. Making an ideal set for an experienced Artists that already has their favourite colours. Artists' Watercolours are characterized by their rich, free-flowing colour, which never leaves any hard lines at the edge of a wash. Their unparalleled performance is a product of precise formulations, based on the suspension of the very finest quality pigments in an aqueous solution of gum Arabic. Only the best pigments, regardless of cost, are used in the manufacture of Artists’ Watercolours. Contents: 24 half pans of Artists' watercolour half pans: Lemon Yellow (651), Cadmium Yellow Pale (611), Cadmium Yellow (612), Cadmium Yellow Deep (613), Cadmium Red (501), Quinacridone Red (528), Alizarin Crimson (515), Permanent Rose (537), Permanent Mauve (431), Phthalo Blue Red Shade (139), Cobalt Blue (109), French Ultramarine (123), Viridian Hue (382), Hookers Green Light (353), Yellow Ochre (663), Raw Sienna (667), Burnt Sienna (221), Light Red (527), Burnt Umber (223), Raw Umber (247), Paynes Grey (065), Ivory Black (034), Chinese White (001) and a metal storage box with thumb ring.